Summer time means summer fun, especially for kids! Children are looking forward to spending a day at the beach with their family to have fun in the sand and the sea. When you have kids with you during your trips to the beach, you know that it is important to bring all the necessary equipment that can make him or her comfortable. Sunscreen, beach toys, swimsuits, and beach towels are always on the list of the things that a parent must securely pack for their children. One of the important equipment to bring with you on the beach is beach chairs. Just as much as adults need somewhere to sit on comfortably, children should have one as well. This is why you should find a beach chair for your little one as well to ensure that he can sit comfortably whenever he needs to rest. 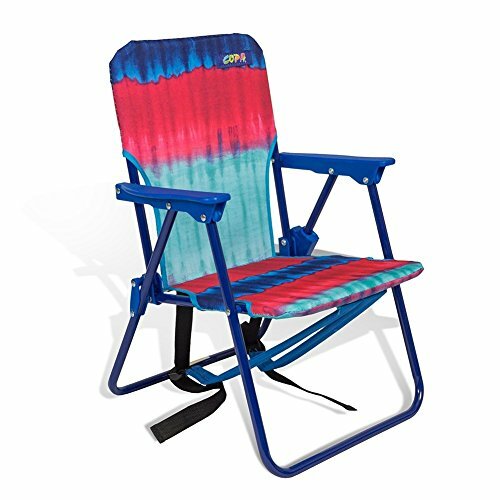 In this article, we are going to look at the features of the Copa Beach Tie Dye Pink Child Beach Chair with Backpack Straps to see if this is the right beach chair for your kids. If you are looking for a kids beach chair that your kids will surely love, the Copa Beach Tie Dye Pink Child Beach Chair with Backpack Straps is a great choice. Kids will love how they have their own version of a beach chair much like their parents. They can sit comfortably whenever they want to rest without the fear of falling over because of its sturdy design. 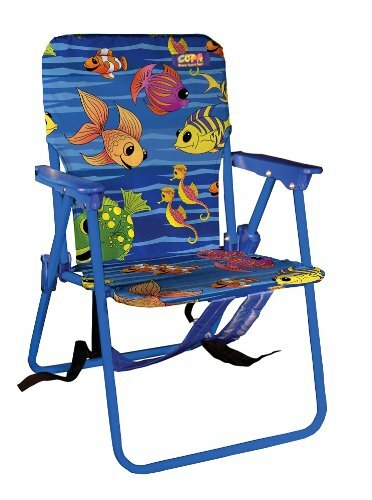 Children from 2 to 5 years of age can sit comfortably in this beach chair since it has a maximum carrying capacity of 50 pounds. There are some children who can fit well in this chair until seven years of age. It has a durable and sturdy seat material that will let your child sit in a comfortable position. Since this kids’ beach chair comes with backpack straps, you can easily carry it around with you whenever you want to head to the beach or have any other activities with your child. Bigger kids can also carry this beach chair on their own since it is not too heavy. Parent don’t have to worry about this beach chair folding accidentally in case their child gets too fussy and won’t sit still because of its safety lock feature. It ensures that the chair is kept open unless you remove it. After your day at the beach, you can easily fold flat the Copa Beach Tie Dye Pink Child Beach Chair with Backpack Straps within a matter of seconds. Furthermore, since this beach chair does not take too much space when folded, storing it when not in use is a breeze. The Copa Beach Tie Dye Pink Child Beach Chair with Backpack Straps is a great addition to your must-have equipment that you should bring to the beach when you go with your little ones. This beach chair lets kids aged 2 to 5 years sit comfortably and be able to relax whenever they need to rest from playing on the sand and the beach. Kids will love how they will have their own version of their parents’ beach chair that they can easily carry around with them because of it backpack straps. For safety, this beach chair features a safety lock that will keep it open and assembled so you won’t have to worry about the child folding whenever you child is seated on it. This beach chair folds flat in a matter of seconds and can be stored easily without taking up too much space. The Surf Gear Little Kids Backpack Beach Chair also has a maximum weight capacity of 50 pounds. It features adjustable backpack straps that let kids carry them around on their own easily. It has a safety clamp that will keep the beach chair assembled in pace so the parent can be assured that it won’t fold accidentally while their child is seated on it. The Everywhere Chair Imprinted Personalized Kid’s Backpack Beach Chair is recommended for children from 2 to 6 years of age. It has a seat material that is made of poly-cotton fabric so your child can sit in it comfortably. It has adjustable backpack straps that will let your child carry it with him on his own with ease. This kid’s beach chair has a maximum weight capacity of 60 pounds. 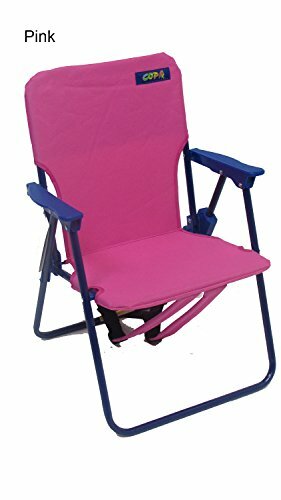 The Copa Beach Tie Dye Pink Child Beach Chair with Backpack Straps is a great beach chair to have when you have kids in your family. This will let them enjoy your trips to the beach since he can have a place to sit on whenever he wants to rest from playing. This beach chair comes with padded backpack straps that will let kids carry them on their own easily. It is sturdy and durable which has a maximum weight capacity of up to 50 pounds. This makes it a great choice for parents who have kids aged 2 to 6 years old. While this kids’ beach chair folds flat easily in a matter of seconds, you won’t have to worry that it will fold accidentally while your child is sitting down. The safety lock feature will keep the beach chair open and in place until an adult removes it. If you are looking for fun days at the beach or anywhere outdoors with your little ones, the Copa Beach Tie Dye Pink Child Beach Chair with Backpack Straps is great to have around.